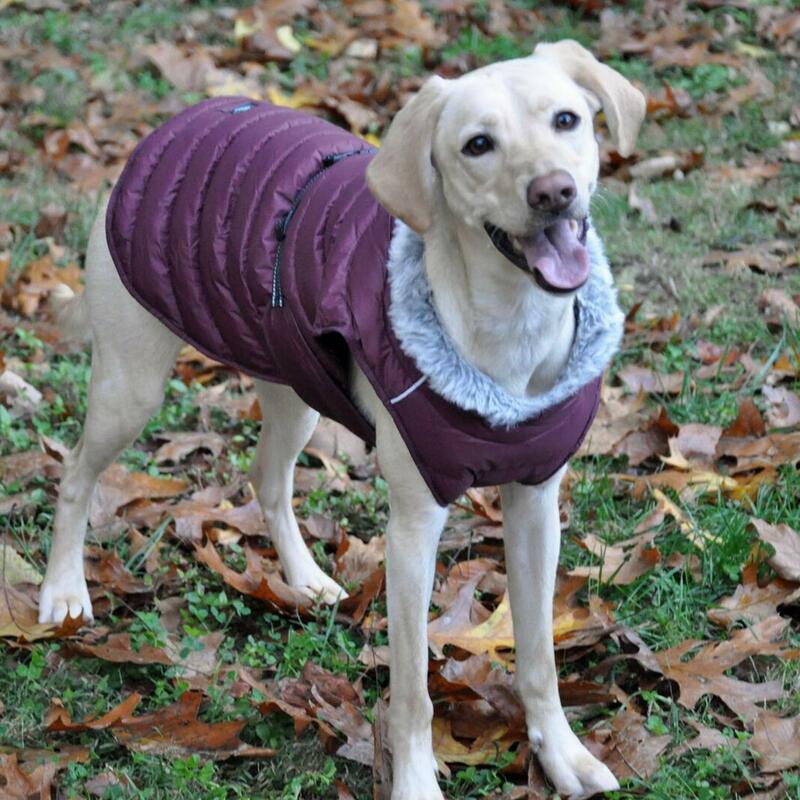 Don't let cold weather keep your pup from enjoying the season with the Alpine Extreme Weather Puffer Dog Coat by Doggie Design in Burgundy. 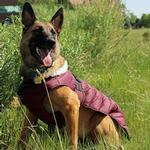 Alpine Extreme Weather Puffer Dog Coat by Doggie Design - Burgundy Customer Photos - Send us your photo! Pippa was a rescue dog we adopted last year. She is everything to us. We plan our days around her. She is very well behaved and friendly. MarleyAnne is loving her ne Alpine Puffer Coat. After one was bought for her niece MarleyAnne’s Dad said his girls needed these as the worked better than any coat we have ever purchased. MarleyAnne has Mega E and this fits perfectly without constricting. She says it also makes her rump look smaller ?? Size small is a good fit for 7lb Noche. The coat has great coverage. It is easy to put on and doesnt have any velcro or zippers to get caught in her hair! Love it! Loved the coat. I did measure my dog. It does not fit around her. We are short by approximately 3 inches. I need an extender. Posted On 02/17/18 by DeAnne K from Lyons, NE Yes, DeAnne K recommends this product! Bought one for our granddaughter GSD who loves it. 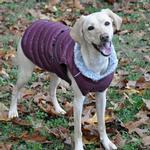 The quality and ease of use along with lofty warmth brought us to order new coats for our two lab girls. I am thrilled with the line and especially thrilled with Baxter Boo staff. If I am ever in doubt with sizing, one phone call and they help me. I will be a Baxter Boo customer for life because of their service and the nice range of products. Purchased one and came back for two more. Our other girls had coats but they didn’t come close to the quality, value and lofty warmth that Alpine supplied in this coat. Sporty look and great fit. Posted On 01/16/18 by Raquel R from oakville, Yes, Raquel R recommends this product! I ordered a xxl for my 55 pound hound based on the measurements provided. The strap around is on the loosest possible setting and if she eats just one more treat it may not fit. Aside from size, I love it. It's super warm (for Canada) and she seems comfy in it which is most important. 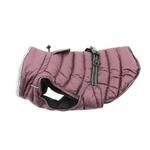 It's hard to find pretty girl coats for dogs my size and this one is pretty, girly, and stylish. The colour is great and I love the fur around the neck detail. Love the way this jacket looks...but sadly the two times my dog wore this, she managed to get these weird rips, like it was slashed with a razor. This fabric is just not sturdy enough. Definitely not meant for big active dogs. Probably fine for little lap dogs. Posted On 12/07/17 by A. from , MN Yes, A. recommends this product! I bought a large for my 22lb mix breed and it fits her well. Posted On 11/27/17 by Bunny L from Okeechobee, FL Yes, Bunny L recommends this product! My dog is a Florida dog and we are heading to the mountains over Christmas. Looks sharp and he seems warm as toast in it!! Posted On 11/18/17 by Hannah M from Raleigh, NC Yes, Hannah M recommends this product! Our Boxer-Jack Russell Mix looks great in this and fits her perfect (Large). The length is great and love how it protects her chest. The buckle is on the loosest setting, but if we went up a size it would swallow her. It does have two elastic straps at the back of the coat to go around her hind legs to help hold the coat down, but she hates that part, so we don’t worry about it. She’s already had los of complements and seems to be warm while being able to move around freely! We have also layered this with the Zack and Zoey Thermapet Nor' Easter Dog Coat on top on extra cold days. The product I ordered was perfect and I can't wait to give it as a gift. Your web site is very easy to navigate and I quickly found what I was looking for and you had the size I needed. The quality was top notch. Thank you.